What is an LGBT Chamber of Commerce? Would you prefer to read the transcript than listen to the episode? No problem! Read the transcript below! Welcome to 30 Days, 30 Voices: Stories from America’s LGBT business leaders. 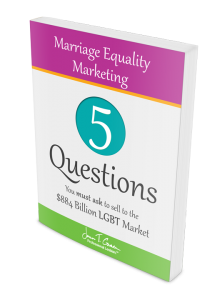 You are listening to a special edition of the Gay Business and Marketing Made Easy Podcast. Tune in for the next thirty days as we interview one business leader per day each day in June to celebrate LGBT Pride Month. That’s lesbian, gay, bisexual and transgender pride month. You’ll learn insights around business and marketing from those who know it best. And now, your host. She’s an entrepreneur, a marketing maven, and an advocate for the LGBT business community – Jenn, with two N’s, T. Grace. Hello and welcome. Thank you for tuning in to this special Pride Month episode of the Gay Business and Marketing Made Easy Podcast. Information about today’s guest and links mentioned in the show will be available on the website at www.JennTGrace.com/30days-30voices. If you like what you hear in this interview, please be sure to tell a friend. And now, without further ado, let’s dive into the interview. I am excited to be talking with Dawn Ackerman today. 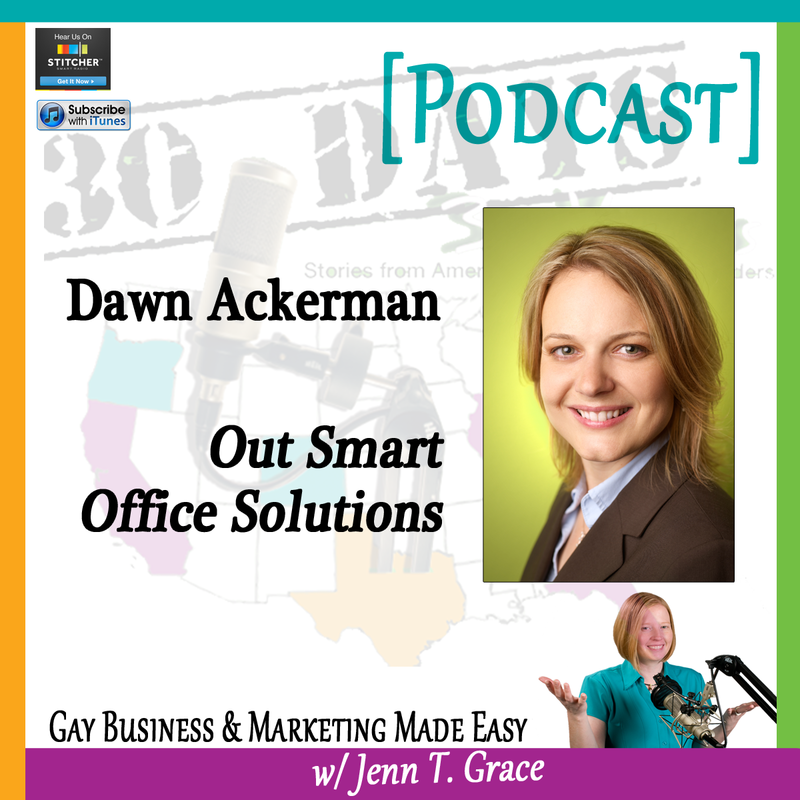 Dawn is the president and CFO of the west-coast based company Outsmart Office Solutions. Prior to this, she was the CEO and founder of EcoToner. In 2012 Dawn and her business partner George were awarded with the Supplier of the Year Award from the National Gay and Lesbian Chamber of Commerce. Additionally she has spent six years on the Board of Directors for the Los Angeles Gay and Lesbian Chamber of Commerce, including two terms as the president. And she is currently serving as the vice president of the Golden Gate Business Association, which is San Francisco’s LGBT Chamber of Commerce. Dawn, I have given the listeners a brief overview of who you are, but why don’t you tell us a little bit more about yourself and your business, and what your path looked like that led you to where you are today. Thanks Jenn. Well that was a pretty good introduction. I have basically been a business owner and entrepreneur since I was about 24 years old. So my path has been every day just trying to build business and building a business that can really do something for the LGBT community. So Outsmart Office Solutions is an office furniture, office interior design and space planning company. We are also the first LGBT tier one partner of Office Depot, which allows us to be able to see office supplies as a certified LGBT company to any company with the support of a company the size of Office Depot. So we have a very large catalog of supplies and a distribution capability that is national because of our partnership with them. We also donate a large portion of our proceeds back to LGBT and environmental non-profits every year. 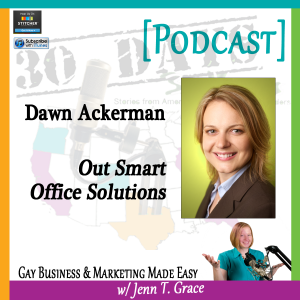 So really Outsmart was formed because of our- my understanding of the LGBT certification.  The first time I ever went to an NGLCC Conference, I realized that some opportunities were going to be out there for certified LGBT businesses, and set on a path to build a company that really could take advantage of those opportunities and be able to support the clients that we could get with the certification. That’s really interesting and since I know what your story is and how you and George came together, if you don’t mind I would love for you to share a little bit more about your matrimony, if you will. Absolutely. I had my company EcoToner that I started in 1997. And I heard about the LGBT certification pretty much as soon as it first started happening. And I got EcoToner certified and went to the NGLCC in San Francisco in 2005. And at that time the attendance was pretty small, certification was new, there was only a handful of corporations there. But I remember sitting in the room really listening to what the certification was all about, and the opportunities that could come from it could be really big. You know? And being one of the first certified companies, this is exciting to me and I kept hearing from people I was talking to when I said, ‘I sell toner and office equipment,’ they would say, ‘Well have you met the guy who sells office furniture?’ ‘No I have not.’ So inevitably at this small conference, I met George Piper. And George Piper had a company that sold office furniture in Seattle and he did office space planning and interior design, and he was certified. And he was also really heavily involved in the GSBA which is the Greater Seattle Business Association, the LGBT Chamber in Seattle; he was vice president. And I was on the board and the president of the LA- actually at the time I had just joined the LA Gay and Lesbian Chamber of Commerce, I wasn’t even on the board yet. But it was very clear to me that he and I both had a passion for our local gay community business, and that we both understood certification in a way that I think a lot of other people didn’t. And we could see the possibilities were there, but we also knew that as independent business owners with kind of two separate products, that really could easily marry to be in the same company. We finally decided that maybe together we would be stronger and have more opportunities. And we took our time to get to that; that was in 2005, we didn’t actually form Outsmart on paper until about 2007, and we really still didn’t start building the company for a few more years. And it wasn’t until 2009, at the NGLCC Conference in Seattle, where we met Office Depot and decided to partner with them and add office supplies to the mix, that we really started to try to kick things in gear and really build Outsmart Office Solutions to what it has become today. And I feel like still in 2013, that we’re only just beginning. Yeah, absolutely. And one of the things that I talk about on this podcast in particular, is supplier diversity and LGBT certification. And a lot of times I’m talking about sometimes you work for a company, or you own a company, that targeting corporation just isn’t for you. But what you just outlined, which was the coming together of two certified businesses to actually form its own separate entity, is something I think a lot of certified businesses can find value in and that’s partnering with each other and finding different opportunities and ways to come together and bid on larger contracts that maybe you yourself may or may not have been able to handle. Yeah. And there’s a difference I think between forming a company together and partnering together. You know George and I really took a leap of faith to assume that a guy that I didn’t know that well that lives in a completely different city; once you become business partners, you might as well be married. You are tied together financially, your decisions affect each other. And we formed a corporation together. So since then, we have found that there are other LGBT businesses that maybe do some of the things that we include in our services that we can work with and we can partner with and we can bid with. But we don’t necessarily have to become business partners and form an entity and share in the day-to-day things that happen in a business. So you kind of have to look at both sides of that. Some things are better kept as separate companies who come together for a specific project, versus forming a brand new company. Yeah, you’re spot on with that and this is something that I have not yet shared with my own listeners; but I actually made the mistake of trying to come together as business partners with a fellow certified business and the two of us had formed a separate entity and it just failed. And it took about two years before it really fell apart. But it was a matter of if we had just worked together and tried to be partners on projects, not necessarily business partners, it would have been far more effective. But lesson learned. Exactly. And you know that’s kind of the way it is with business in general. I have actually been an owner of four different companies over the years, and business partners with multiple people. And some of them really went the wrong way. One of my business partners I’m still very good friends with, I’m the godmother of her children. She just wanted to get out of business. But somebody else that I was in business with briefly, I don’t even speak to that person anymore. So you really have to be careful. It’s the nature of the beast. It really is the nature of the beast. And you have to make sure I think, that as with any relationship you get into, that you’re coming from it with the same mindset, and that you really want- you have to have common goals and know if the business is successful, this is what we are going to do. If the business is not successful, this is what we are going to do. But you kind of- it’s not easy, it’s just not easy. Yeah, you’re spot on. Let’s see, so we already jumped into some really good information just in the first couple of minutes here. Typically before I get into some of the more nitty gritty detailed meaty stuff, I like to ask a personal question that just highlights something interesting about yourself. And that is, is there some sort of fun fact or just something about you that very few people know or would expect? Maybe. Well I could say that I actually have my college degrees are in psychology and biology. And I was really fortunate to go to a university with a very robust and unique biology program, where I have been able to learn anatomy and physiology by working directly on human cadavers. I have been able to dissect the human brain independently on my own. And I worked for the US Department of Agriculture trapping gypsy moths in the summer. So before going into business I actually really had a pretty- multiple years of doing all sides of biology and nature. I mean I got to taxidermy a great horned owl and so, yeah. I actually really enjoyed that, I feel like my college degrees were more like what has become my hobby versus what has become my business, or my career. That’s funny, I can see you as like dissecting cadavers as a hobby. Well maybe not so much that anymore. But bird watching and insect collecting, and just getting out. I went to Yosemite last weekend with my partner and we hiked to the top of Yosemite Falls. And we just always have binoculars with us, and I’m always looking for peregrine falcons because I think they’re such beautiful birds and so hard to catch a glimpse of them for real. So yeah, I guess that would be the interesting fact about me that not a lot of people know. That’s really interesting though. That’s awesome. So what was your ‘ah-ha’ moment, if you had one. Or perhaps it was a series of ‘ah-ha’ moments that you realized that doing what you’re doing today is what you are supposed to be doing? You know I guess I could say that maybe once I got involved with certification and the NGLCC and that 2005 conference, when I first really learned about certification and what it could become, was probably what made me decide that I was going to stay on the path that I was on. You know I didn’t actually mean to get into the business of selling toner. It kind of just happened because I got out of college, I moved to Los Angeles, and realized that finding a job with my bachelor’s degrees was not really going to be that easy. And if I didn’t go on to graduate school, that I just- I worked in a methadone clinic, that was my first job in LA which was to council heroin addicts with my psychology degree. That lasted for about three months and I had to get out of there, it was the most depressing job ever. And so I kind of fell into starting this business of selling toner, and it’s not really where I wanted to be, but once I realized that I could kind of take this business in a direction outside of where other people were doing it, and do it with a focus on the LGBT community and certification and selling environmental products, and then adding supplies and furniture and all this other stuff to create this more encompassing office solutions business; that got me much more excited about what I was doing. Yeah, it sounds like it would. So that actually leads into my next question, which is what inspires you and keeps you motivated to continue doing this every day? New opportunities. Really finding new opportunities, looking for new products that we can sell, taking the product that I’ve been selling now for years and actually going in the opposite direction. We’ve just recently become the first LGBT vendor to Office Depot; so we’re going to be selling our own Outsmart branded EcoSmart toner to Office Depot, to then for them to distribute to their end users through their catalog. So we’re always- I think George and I are always focusing on what can we do to kind of pioneer the LGBT business movement in different segments and in different directions. And how can we get more companies, or more government agencies to include LGBT businesses? 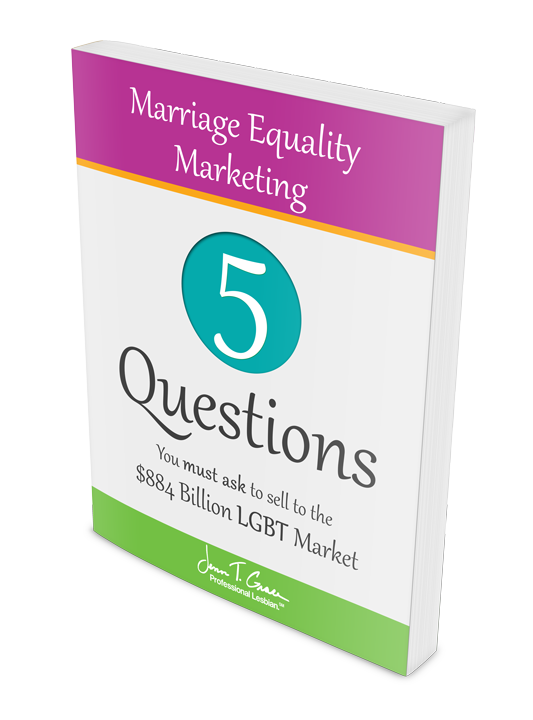 How can we take the LGBT business movement and push it just a little bit further every day, or every year. That’s such a great motivator. I feel like that’s something that should be a motivator for a lot of people listening to this as well. Yeah, I mean I think it’s part of why I get involved. I went from being involved in the LA Gay and Lesbian Chamber to when I moved to San Francisco, I immediately got involved in the Golden Gates Business Association, which is actually the oldest LGBT Chamber of Commerce in the country. And I got involved as a member and I’ve been here about two years, and now I’m the vice president. And the reason for that, is because when I came in I explained to them that certification was an important thing that needed to be offered to the members of every LGBT chamber, because there are companies that could really benefit from it if they understand it, and know about it, and know how to use it. And so my job, or my goal, getting involved with the GGBA was specifically to promote certification. Which is a fabulous thing to be promoting. I would- and this is me going rogue off of our questions, as I usually do. But if somebody’s listening to this, because I have a lot of LGBT business owners who are listening; but I also have a lot of allies to the community who are listening. And for those who may be in an area of the country where there is not an LGBT chamber accessible to them, what type of advice would you give them in terms of still being able to participate in that certification program, even if there isn’t that resource that’s really close proximity-wise? Well I think that just reaching out to the National Chamber by coming just to the annual event. If you just come to the National Chamber’s annual conference, that is a good way to get started. You’re going to meet so many people from all over the place; I mean I think about the fact- okay, yeah I live in San Francisco. My business partner works in Seattle. We have clients in New Jersey. You don’t have to have a chamber in your backyard. The internet connects people in a way that we’ve never been connected before. Between Facebook and LinkedIn and Twitter, and this and that, and I feel like that’s changing every day as well. You know you really can work with anyone, anywhere, if you set things up correctly. So yeah, I think just getting involved on a national level and coming to the annual event is enough to get started and get you excited. And you never know, if there’s no chamber in your city, you come to one NGLCC event and you may go home and start it. I was so going to say that, because obviously we both have a long history of involvement with LGBT chambers, and in the book that I’ve actually recently released, I have a little side note in there saying, ‘If there isn’t a chamber in your area, consider starting one. If you do, let me know.’ So it’s funny that you actually said that too. Well if you look at the history of LGBT chambers in the United States and why most of them got started. It was like gay bar owners who were tired of the local police force harassing their patrons. And so they banned together to form a kind of committee or a group, or a little local chamber is what really came out of that. Because they needed to be able to share information with each other. Exactly. So it’s really no different now. I mean our chamber, and I know a lot of other chambers offer like business networking groups within the chamber itself. And I meet with a group of about twenty people every other week in the Castro for an hour, where we all take turns giving a little 30-second pitch about our business, and really just getting to know each other. And the more time we spend together, the more comfortable we are referring our customers to each other for the different services that we provide. And you can do that without having a specific set aside main chamber of commerce. Just find other like-minded people in your community and start getting together for lunch every week, or coffee, to get to know each other and being able to figure out how to do business with each other to strengthen the equality economy together. That’s such great advice, and it leads directly into my next question which was, what is the best piece of business advice that you’ve been ever given? Well I don’t know if this is necessarily- I don’t know, somebody I’m sure came up with this quote years ago, maybe someone famous. But really it’s better to try and fail than not to try at all. And I think that that’s really what you have- as an entrepreneur you have a lot of fabulous ideas. At least you think they’re fabulous. And you really have to try things. And some things are just not going work, and you’re going to say, ‘Wow, why did I do that? Why did I waste that time? Or why did I waste that money.’ But if you don’t try at all, you’re really not going to move forward. So you really have to be okay with failing, but you have to continue to do it, you have to continue to try. It’s trial and error, and that’s kind of something that I guide myself on too. And like I mentioned before with my past business partnership failing; it was one of those things that I had to try it, I had to have that experience, and even though the business itself failed, I am in a far better position now because of that failure. Yes, exactly. And what you take away from it though, or try to learn, is maybe next time you do this, this and this beforehand. Before you try it. Or you set a more of a limit to how much time or how much resources you’re going to put into something so that you don’t kind of overstep the budget or the timeframe. Because it’s just really easy to put yourself almost really backward if you’re not careful because you’ve tried something and it’s failed miserably. We’re all human at the end of the day. So let’s switch gears just a little bit and go back to talking about some marketing. 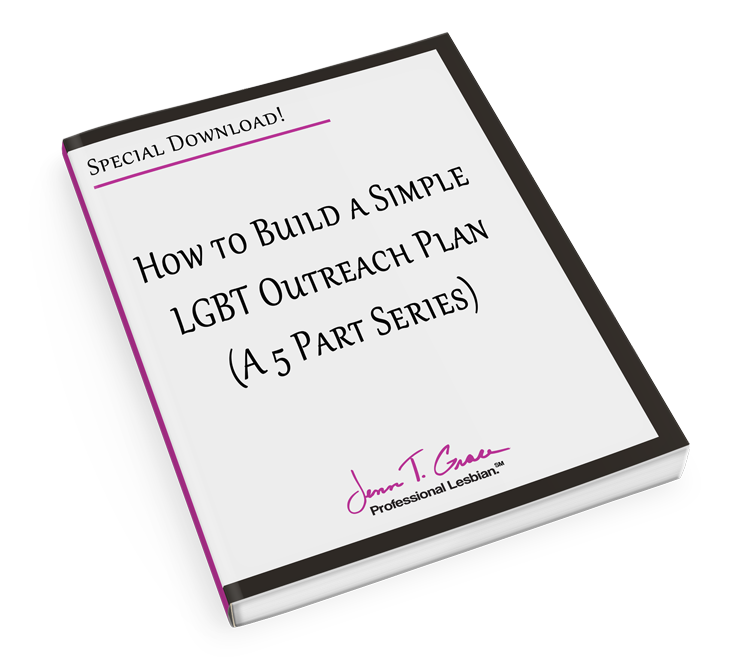 And for listeners who are now listening to this because they’re interested in marketing themselves to the LGBT community, do you have any particular advice that you would give to them that would enable them to be successful in doing that? Wow. You know for me I think it’s all about relationships. It doesn’t matter what you sell or what you do. I really think that you have to get involved and you have to get to know people, and you have to build relationships. And the more relationships you build, the more you get to know people, the more they trust you, the more business they’re going to send your way. I mean until you become some really recognized, well-known brand, where everyone wants to buy it because of your brand, it really is still about relationships. Yeah people buy from people, not from companies. Comes up quite frequently as a good quote that people go by. So along similar lines, and I can think of 1,000 ways that you’ve been able to leverage your status as an LGBT business owner. But for somebody who’s listening to this who may be an LGBT business owner and they’re trying to figure out how they can leverage that in a way that makes them successful in what they’re doing. Do you have any tips or tricks around what that might look like? Well I think first you’ve definitely got to make sure you’re comfortable being who you are. 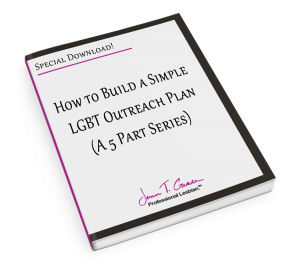 You have to be okay with being out as a business owner, if you’re going to leverage being an LGBT business owner. And I don’t know that everybody is. I think some people are still very- a little timid about it, or a little scared that somehow they’re going to lose a customer if they come out. My first business was not built on that fact that I was an LGBT business owner, it was just a business. And most of the customers from that company didn’t have any clue of who I was or anything about me. When I built Outsmart, I mean we didn’t just build it as a certified business, but we named it Outsmart. You know, I mean we really wore our LGBT label kind of on our sleeves with this one. And that opens a whole different can of worms when you’re out talking to people; you have to be not only willing to say, ‘I’m an LGBT business owner, and I’m certified,’ but then explain to people why that’s important. And why their company maybe should be taking it- should be including LGBT businesses. Or whatever. You have to become an advocate for the LGBT business movement if you’re going to be promoting yourself and be out as a business owner. That is such awesome advice, perfect. Thank you for that. So along business lines, is there a business book or a program or some sort of tool that’s transformed the way that you’re doing business? Ted Talks; I really like Ted Talks, all of them. I find a lot of them, they’re very interesting. I don’t spend enough time actually watching them, I should spend more. As far as books go, when I read I actually read to kind of escape from business and other things. I think the last book I read was the Empire of the Ants. But from a tool perspective, the cloud. I know that sounds kind of crazy but in the years that I’ve been in business, I’ve had so many computers that have gone away and all of a sudden it’s like, ‘Oh no. That thing wasn’t backed up.’ And with the cloud I don’t worry anymore. I can get a new computer and everything’s still there. And I can go places, I’m not chained to a desk and a landline like I was in the early days of being in business. I’ve got an iPhone and a Mac laptop, and I can pretty much work from anywhere in the world at least for a few weeks at a time, and no one really even knows the difference. Isn’t that great? I think about that often that I find myself in the most random places working. Like I was writing chapters for my book one day by the river in my car, just randomly because it was a nice day out and I wanted to have some fresh air. And nobody knows the difference, it’s fabulous. It’s wonderful. It’s so much more freedom in a way, it’s just really nice. Yeah, absolutely. So this is the last question before we say goodbye, and I’m really curious to know what is happening in your business right now that is just super exciting? Well some of the big things is trying to finalize this whole becoming the first LGBT vendor to Office Depot, which is exciting. It’s a little nerve-racking too though, because a lot of people may know that Office Depot and Office Max are possibly merging. So we’re hoping that that is a good thing and not a negative thing, if that takes places with our partnership with them. Also we’re starting to add new lines of product to our business, new lines of furniture, which his always exciting when you have more options for your clients. And we’re building a new website which I know it sounds crazy, but from a business standpoint you’ve constantly got to be redoing things like that. It’s never a finished project. We did a website a few years ago. It’s old, it’s terribly now, it’s time for a new one. And so you’ve always got to be redoing things and making changes to stay new, to stay fresh, to stay exciting. And as an owner, you can’t just do one thing, you’ve got to do all of those things. You know, even if you have employees, you’re still in charge of the finances, you’re in charge of the sales, you’re in charge of the marketing, you’re in charge of the vision. And so every day it’s like being in a new position to make things move forward. And I think at the end of the day, I think that’s one of the most exciting things about being a business owner. And I guess I suppose it’s also one of the hardest things about being a business owner. But every day is different, there’s no two days that are identical. And being able to wear those different hats is refreshing in so many ways but then of course stressful in so many ways. Yes, exactly. There are some days that I just want to go get a job. You know what I’m saying? But it’s like, what would I do? I’ve been a business owner most of my adult life, and to just go get a job- what would that even mean? I’m not sure. Jenn T Grace: I actually was having a conversation with my wife about that just a couple of weeks ago, where I was saying to her, I’m like, ‘I don’t know how I would handle myself in a position where I just had one job to do. And all I had to do was go and show up and the responsibility wasn’t mine.’ Like I have no idea how that would feel or what that would look like. Yeah, I know. Me neither, which is why I just keep doing what I do every day. Yeah, same here. Well you have given us some awesome tips and advice and this has been an awesome interview, so thank you very much for that. Thank you, you’ve been a great interviewer. Oh, well thank you. Before I let you go though, I do want to make sure that you give yourself a plug and let people know where they can find you or find your products, your business, et cetera. Sure, well you can go to www.OutsmartOffice.com. We’re also on Facebook, we’re OutsmartOffice on Facebook, we’re OutSmart on Twitter, and I am Dawn Ackerman and if you Google ‘Dawn Ackerman Lesbian,’ it’s all me. But on Twitter I’m OutSmartDawn, so there you go. That’s awesome. Thank you again, this has been fabulous and I hope to connect with you soon. Thank you very much Jenn, I really appreciate it. Thank you again for listening to this special Pride Month episode of the Gay Business and Marketing Made Easy Podcast. To see a full lineup of the thirty guests featured throughout this series, visit www.JennTGrace.com/30days-30voices. And if you liked what you heard here, consider leaving a review in iTunes or telling a friend or colleague. You can do both of these easily by visiting www.JennTGrace.com/iTunes. Thanks again and stay tuned for the next interview by another amazing LGBT business leader.